Disney California Adventure will be home to the new Pixar Pier in the summer of 2018 and Disney is giving guests a preview of what’s to come. 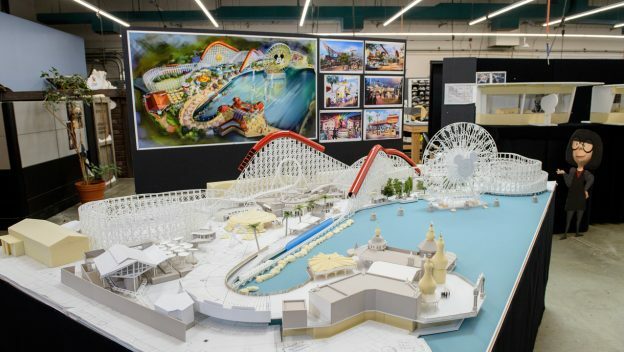 Pixar Pier will be home to “whimsical” neighborhoods and fan favorite Pixar characters from popular films. The area will also include re-themed attractions, new food and merchandise, and the neighborhoods will be inspired by Pixar films, including The Incredibles. That neighborhood will feature the Incredicoaster and the loading area for the coaster will be inspired by the Parr family’s home from the film. Additionally, the 24 gondolas on Mickey’s Fun Wheel will feature Pixar “pals” and the Boardwalk games will also be inspired by Pixar characters and films. Pixar Pier is slated to open in the summer of 2018 during the Pixar Fest. Guests will also have a chance to see the new “Together Forever – A Pixar Nighttime Spectacular” fireworks spectacular, and the return of Pixar Play Parade and “Paint the Night” parade.